About the Hike: Three short paths lead to viewpoints of Kiger Gorge, the East Rim, and Steens Summit. A longer trail descends to Wildhorse Lake, in a treeless bowl of wildflowers. Difficulty: Altogether, the three viewpoint trails are an easy, 1-mile hike with 250 feet of elevation gain. The trip to Wildhorse Lake is a moderate 2.4-mile hike with 1100 feet of elevation loss. Season: mid-July to late October. Getting There: Fill you car's gas tank in Burns. Then drive 1.7 miles east on Highway 78 toward Crane and turn right on paved Highway 205 for 61 miles to Frenchglen. A tiny store sells gas, but only when it's open. Just beyond the Frenchglen Hotel, fork left onto the gravel Steens Mountain Loop Road for 2.9 miles to the Page Springs Campground entrance. Keep left, past a snow gate that's closed from about mid-November until mid-June. Beyond the gate, drive 13.2 miles up the loop road. Then, if you like, detour to the right into the Fish Lake Recreation Site. Mountain lakes are rare in southeast Oregon and this pool's a beauty, with a campground and picnic area among silvery-leaved quaking aspen. Next continue up the main road another 5.7 miles, passing a snow gate that's closed from about November 1 until July 1, depending on snow levels. At a pointer for the Kiger Gorge Viewpoint, detour 0.4 mile to the left to the first of the recommended viewpoint walks. Hiking Tips: From the Kiger Gorge Viewpoint parking area, walk 100 yards to a cliff-edge panorama of Kiger Creek's gorge. This colossal trough breaches the mountain's crest, leaving a gap called Kiger Notch. Then drive back to the loop's main gravel road and continue 2.7 miles to a 4-way junction. First turn left for a 0.3-mile side trip up to the East Rim Viewpoint and a dizzying look down to the Alvord Desert. Then return to the 4-way junction and follow a "Wildhorse Lake" pointer left on a rough dirt road for 2 miles to a parking lot at road's end. The sparse blooms of white yarrow, pink desert buckwheat, and white phlox struggle here in a field of lava rocks encrusted with black, green, and orange lichens. Two trails start from this parking lot. If you're headed for Steens Mountain's summit, simply hike up a barricaded, steep, rocky roadbed 0.4 mile to a crest. The actual summit is 100 feet to the left. To the right, you'll find a different viewpoint just beyond five small radio buildings. If you have a little more time and energy, however, try the other trail from the parking lot. This path heads downhill past a hiker registration box for 0.2 mile to a rimrock cliff overlooking Wildhorse Lake. Here the trail suddenly turns left, traversing down a precariously steep rocky slope. Soon the path begins following a brook through increasingly lush meadows, ablaze with pink monkeyflower, orange paintbrush, and yellow Oregon sunshine. At the 1.2-mile mark, the narrow sandy beach of Wildhorse Lake makes a good turnaround point. If you're backpacking, camp well away from the fragile shore-and bring a cookstove, because there are no trees or firewood of any kind. After the hike, it's safest to drive back to Frenchglen the way you came. If you have a rugged vehicle with high clearance, however, you can drive back 2 miles to the 4-way junction and turn left on the continuation of the Steens Mountain Loop Road. This longer, scenic route to Frenchglen covers new ground, but includes a rough, 6-mile stretch of steep, rocky road. History: Pete French built a cattle empire on the west side of Steens Mountain from 1872 to 1897. French's P Ranch near Frenchglen is now owned and maintained by the Malheur Wildlife Refuge. By 1901, Basque and Irish shepherds were grazing more than 140,000 head of sheep on Steens Mountain, obliterating once-lush grasslands. 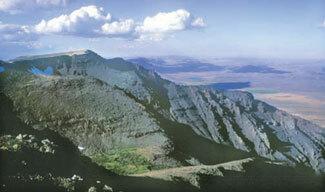 Congress protected much of this 50-mile-long mountain with the 174,573-acre Steens Mountain Wilderness in 2000. In many places the wilderness boundary flanks the Steens Mountain Loop Road on both sides. Vehicles, sheep, and cows are banned in the wilderness. Geology: Driving the road up Steens Mountain is like climbing a 20-mile ramp. A tilted mesa with an active fault on its steep, eastern side, this fault-block mountain has risen up in the past five to seven million years. During the Ice Age, seven large glaciers gouged 2000-foot-deep, U-shaped canyons into the western slope.